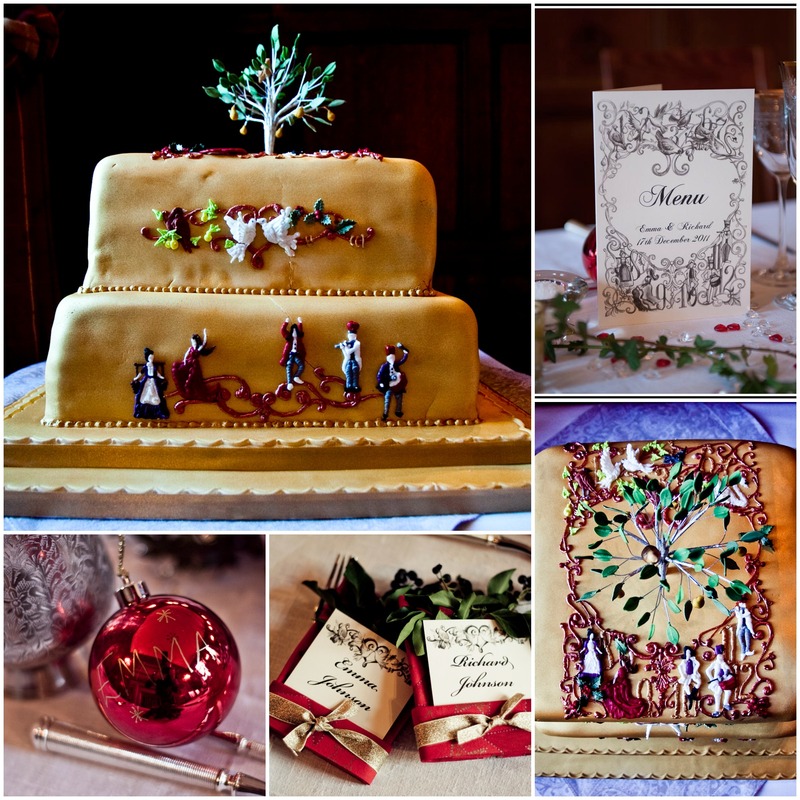 There is something about festive decor that just makes me feel warm and cosy…. Which is one of the many reasons we got married at Christmas. And why working out the decor, flowers and themes gave us real scope to have some fun and embrace everything we loved about the festive season. 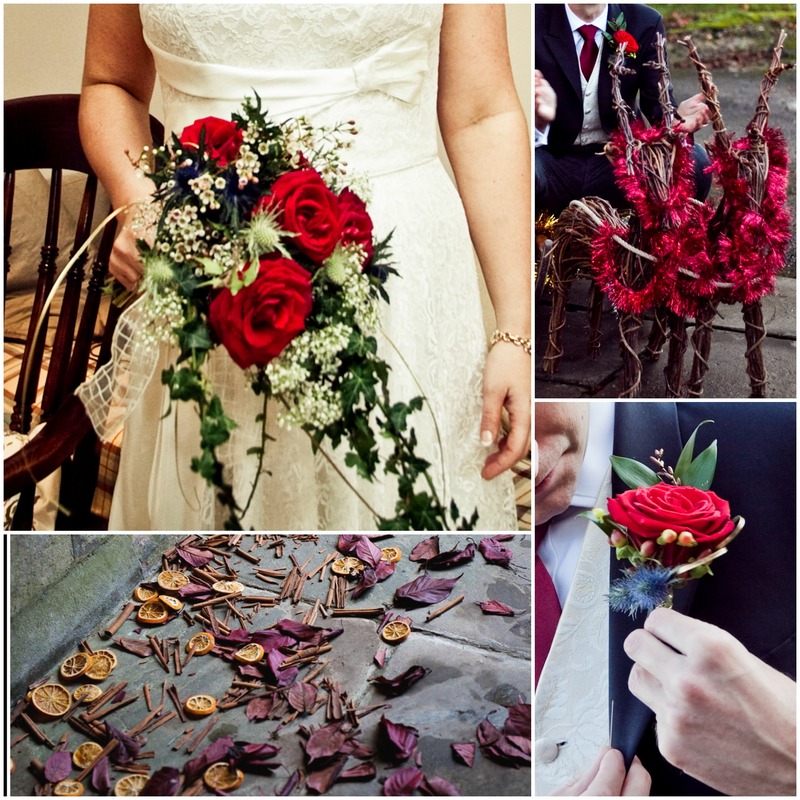 We picked red and gold as our key theme, a classic Christmas colour combination, and one that I felt would be perfect for creating that romantic, candlelit vibe. We also used white and green as a base note throughout – white tablecoths on the tables, ivy in the flower arrangements. This allowed the stronger colours to take centre stage and really stand out. 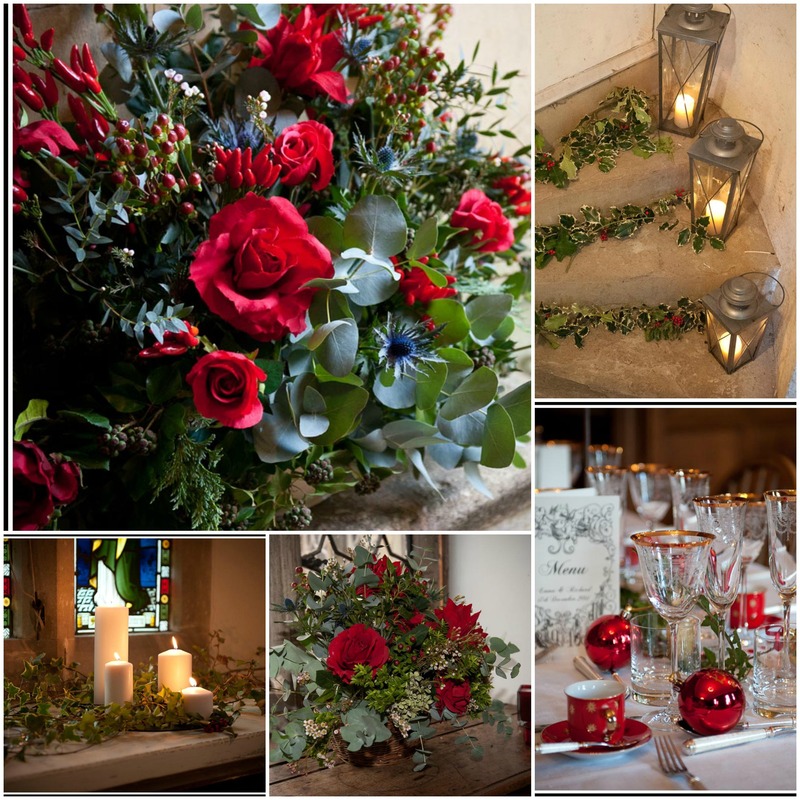 In the church, we focused heavily on ivy and green foliage, accenting it with white flowers, and then had bold flecks of red bursting through in the form of roses and berries; while on the tables we had mistletoe and ivy running down the centre of the table, lit by tiny gold nightlights dotted throughout the greenery. For bouquets, buttonholes and arrangements, we bought all flowers wholesale at New Covent Garden market, which meant we used only what was in season. We had berries, ivy, mistletoe, holly, thistles and poinsettias, as well various spruce and fir off-cuts and plenty of greenery and leaves to bulk everything up too. Outside the church we used cinnamon and dried orange pieces in the porch which, when cracked under foot, released that wonderful Christmassy spice smell. We wanted to use as many of the Christmas traditions as possible, but tried to tread lightly with it, not wanting to turn our wedding into a re-run of Christmas Day. For a sort of theme we used the wonderful song Twelve Days of Christmas, and a graphic designer at work designed a beautifully pencil-drawn motif we used throughout the invitations, Order of Service, Menus and even our cake which came complete with a three-dimensional icing Partridge in a Pear tree atop the cake. We also used Christmas trees throughout as part of the decor in the dining room, and had a huge fir in the entrance hallway, under which everyone put our wedding presents. We kept with the tree theme elsewhere as well, giving out personalised baubles as party favours, but which also doubled as placenames. On the day, the sun was shining and there was a frost in the morning. It was beautiful and crisp and incredibly romantic. 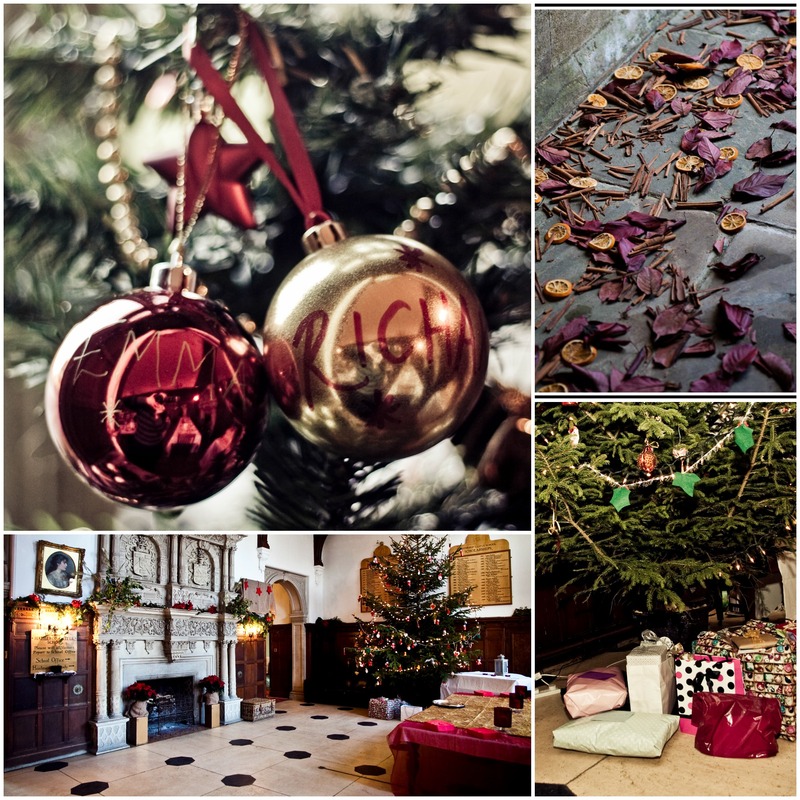 Our festive theme felt perfectly matched to the wintery day, red lanterns, candles everywhere, a roaring log fire in the hallway and sparkling Christmas lights throughout. There was no doubt it was December, and it felt like a real celebration of love, and Christmas.